The Community and School Association (CSA, a.k.a. “ Anjoman “) of the Iran Cultural and Educational Center (ICEC) is a liaison group between the families, the community at large, and the Center. This association-Anjoman exists to provide a vital service to the Center’s leadership and the Center’s community by involvement of parents in the activities and general welfare of the Center. The Association-Anjoman’s main purpose is to build a support network among families in its community that can assist ICEC to achieve its stated mission of promoting the Iranian culture. 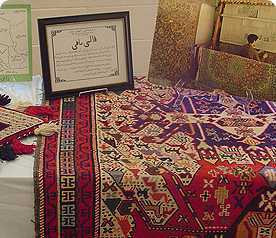 Through promotion and facilitation of communication and cooperation between parents, teachers, administration, and, planning and executing cultural activities, the association enables the students at the center to become familiar with their heritage and get involved in their community and for parents/families to meet other parents/families in a friendly way. The Association-Anjoman is a volunteer based group. The members are the parents, guardians and/or custodians of currently and /or past enrolled students at the center. Members are invited to the center’s various socials for all year groups and family events. The activities of the ICEC’s Association-Anjoman are carried out by elected officers selected from among the members of the Association-Anjoman. The Officers include representative of the families currently attending the center. The Officers consist of the following members: the current president, the immediate past-president, the president-elect, and four vice-presidents (administrative, finance, culture and education). The officers meet as needed and have written responsibilities to follow. The president is responsible to organize Association-Anjoman meetings and to report directly to the center’s officers. The Association-Anjoman has various committees that are active in the planning, preparation and implementation of cultural events at the Center and in the community. The membership to these committees is open to all families. The member can sign up for the committees of their interest at the first Association-Anjoman meeting which is held in the fall. Each committee will choose a chair to be responsible to liaison with the Association-Anjoman’s officers and report back to members. For more detailed information about the Association-Anjoman’s organizational chart, officers’ responsibilities, and committees’ descriptions, please visit the Association-Anjoman’s members only page. The ICEC has a user group email, where the center’s announcements, information and volunteer opportunities are communicated to the center’s members regularly. If you are interested in joining the email group, please sign-up during registration or contact one of the CSA’s Officers. The members of the Association-Anjoman are welcome to participate in volunteer opportunities at ICEC. Please sign in and then go to join different groups. It is the Association-Anjoman’s hope that there will be an area (or areas) of particular interest to the member and that she/he chooses to become involved as a much-appreciated volunteer.